Banana squash can grow to be very large in size, averaging 60-91 centimeters in length and 18-22 centimeters in diameter, and have a cylindrical, slightly curved shape. The thick-walled rind is smooth and depending on variety, can be salmon pink, blue, yellow, or variegated in color. The orange flesh is firm, dense, and meaty with a hollow seed cavity encasing stringy pulp and cream-colored, hard, flat, and oblong, small seeds. When cooked, the flesh of the Banana squash is fragrant, dry, rich, and earthy sweet. Banana squash is available year-round, with peak season in the fall and winter. Banana squash, botanically classified as Cucurbita maxima, is a large winter squash that belongs to the Cucurbitaceae family along with pumpkins and gourds. Banana squashes have a long cultivation period, can weight up to thirty-five pounds, and the plant requires ample space as the vines can roam over six meters. There are many cultivars of Banana squash, including pink and blue varieties, hybrid varieties often labeled as "rainbow," and heirloom varieties. Banana squashes were extremely popular in the early twentieth century, but they eventually fell out of favor to modern winter squash varieties such as butternut, acorn squash, and baking pumpkins. Today Banana squashes are known for their large size, unusual shape, and versatility in culinary applications. 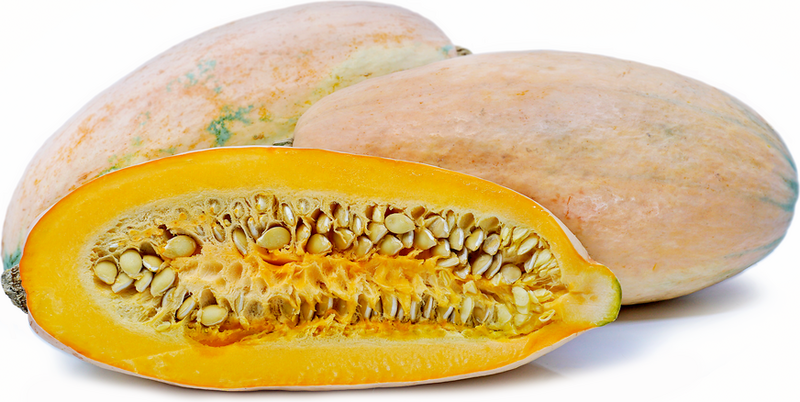 Banana squash contains vitamins A and C, some B vitamins, calcium, iron, and fiber. Banana squashes are best suited for cooked applications such as steaming, roasting, baking, grilling, and frying. As a true winter squash, it can be used in place of other orange-flesh winter squash varieties such as butternut and kabocha. Banana squashes are commonly sliced into rings or cubes, roasted, and added to soups, chili, and stews. They can also be served as a stand-alone side dish or shaved thinly and added as a pizza topping and to fresh green salads. Banana squash pairs well with butter, creme fraiche, aged sheep's cheeses, cream, pork belly, lamb, truffles, apricot preserves, orange juice, and herbs such as thyme, bay, sage, rosemary, cumin, curry, ginger, cinnamon, cloves, and nutmeg. They will keep for a couple of months when stored in a cool place with relative humidity. The popularity of Banana squash, since its introduction, has predominantly been in the Americas, most notably in the western states of North America, but the pink varieties of Banana squash are also popular among the Mennonite farmers of Ohio, Pennsylvania, and Maryland. Banana squash is often sold in slices at markets as consumers can be intimidated and overwhelmed by its large size. Banana squash is also valued for its novelty, but its popularity has decreased as personal sized squashes such as the acorn have established a presence in the market as an easily prepared squash with a healthier serving size. Squashes of Cucurbita maxima can trace their origins back to South America, especially to ancient sites in Peru, and the family of Banana squashes was introduced into the United States by R.H. Shumway in 1893. Though the Shumway seed catalog would be the initial Banana squash orientation within the U.S., other seed catalogs would soon follow, and by the early twentieth century, the Banana squash became a popular winter squash variety. Today most Banana squash variety seeds are housed among heirloom seed savers and are rarely found in the commercial marketplace. If available, Banana squashes can be found at specialty grocers and farmers markets in the United States and select regions of Central and South America. Recipes that include Banana Squash. One is easiest, three is harder. 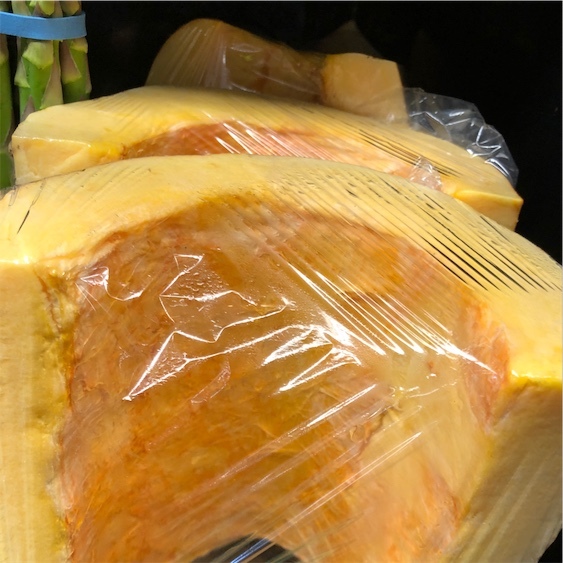 People have shared Banana Squash using the Specialty Produce app for iPhone and Android.